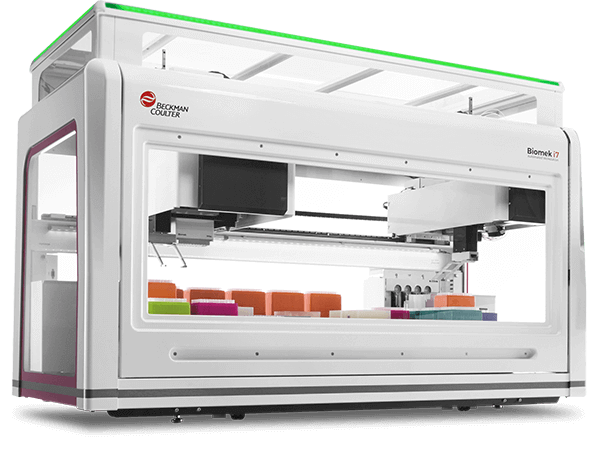 The Biomek i7 Mch 96 HT Target Prep Workstation is specifically configured for automated processing of Thermo's Axiom(TM) 384 kit. The system comes standard with on-deck process control elements such as shaking peltiers that enable 384 samples to be processed with minimum hands-on time. Thereby increasing overall productivity and efficiency for the lab. The solution includes a standard method provided by Thermo that's built on industry leading Biomek software and includes an intuitive user interface and tools like Deck Optix(TM) (hyperlink to Deck Optix) to better ensure accurate setup and reduce costly errors.